I’ve published a few updates for Pixel Driver without updating the blog again, sorry just too busy with the gamedev stuff. v0.8.0 brought a whole new style to the game using outlines around objects creates a more distinct and cartoon style. Clouds has also been added to the game to give it a more organic feel. 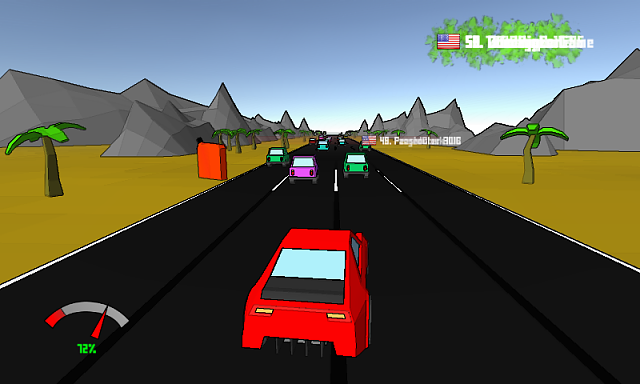 The AI in the game has also learnt to overtake slower cars and also does a better job at breaking for objects. Speaking of objects now there are obstacles that occur after a while which blocks the road. * Android first real release. * New Feature: When cars or upgrades are possible you will get a notification about it. * New Feature: When you run out of fuel but still manage to refuel before the car stops then you can keep going. * New feature: You can set the Toon level in settings. * New Feature: Game will auto set graphical level based on performance of device. * Improved: More twitchy controls through joypad, faster respons. * Improved: AI Made the full stop a little softer. * Improved: Added loading text on menu when level loads. * Improved: Coins x2 is more visible on Android. * Fixed bug: On Android you only needed to touch the screen once to keep on going without the need to tap after you run out of fuel. * Fixed bug: Players new name was not saved properly. * New Feature: Road can be closed. * New Feature: New soundtracks. * Improved: Tweaked the AI even more. * Improved: Increased player cars turn speed. * Improved: Added re-fuel stations on both sides of the road. * Improved: New re-fuel stations. * Improved: Lot’s of smaller tweaks. * New feature: Warning when a car is approaching you from behind. * New feature: Added pretty clouds. * Improved: Changed graphical style to a more cartoon style (cellshading). * Improved: AI cars can change lanes and are better a breaking for other cars. * Improved: Variation to desert level with more objects. * Improved: Added cars that drive faster then you and pass from behind. * Improved: Fuel is filled up when tutorial is done. * Improved: Cameras distance from players car varies slightly depending on the car you are driving. * Fixed bug: Coins and fuel cans could spawn on other objects such as trees, signs and more. 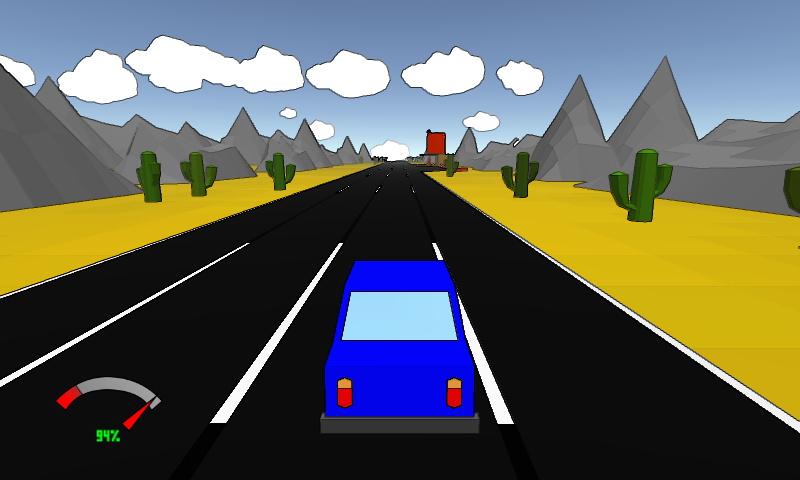 * New Feature: Added fuel gauge. * Improved: Increased speed of all cars. * Improved: Increased how much the car turns. * Improved: Changed how acceleration works, faster cars accelerate even faster. * Improved: Adjust difficulty, make is slightly harder, traffic jams are a bit heavier. * Improved: Traffic Level increases over time making it harder to just go at full speed. * Improved: Itch version gets 2x coins too. * Improved: Coins and fuel cans drop more often if you drive faster. Before it was based on only time. * Improved: Coins and fuel cans drop less frequent as the game proceeds making it more difficult over time. * Improved: AI cars do not spawn while tutorial is running. * Improved: Added support to quit the game with Esc or use back button on mobile. * Changed: Upgrades price is based on default upgrade levels. * Changed: Increased prices of new cars. * Improved: “Lines” marking where the other players best distance was is less transparent now. * Improved: First car has a bumper. * Improved: Increased resolution if flags. * Improved: Game over screen is slightly less transparent. * Fixed bug: Sorting flags and player names when you pass them now works properly.